Twenty mile Catalina swim — accomplished in 2014. Twenty-one mile swim across Lake Tahoe — accomplished in 2016. 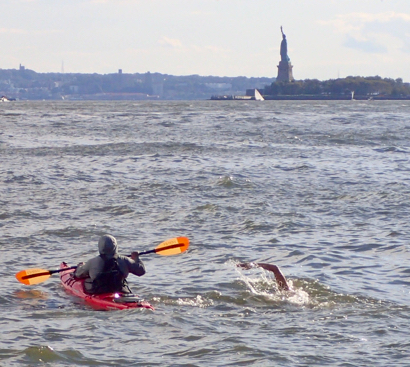 And this year, Dr. Scott Kaloust chalked up another “completed,” swimming 28 miles around Manhattan and finishing first in his group with a time of 7 hours and 45 minutes. “It’s not a race; I was just the fastest that day,” Scott explained. Organized by New York Open Water, the swim is called 20 Bridges, named for the 20 bridges on the Hudson, Harlem and East River that swimmers pass under. It was held six times over the course of last summer. Twelve swimmers were selected for each swim based on a number of criteria including the order in which the person signed up, preferred swim dates, completed qualifying information and field diversity for each date (age, gender, nationality). Indeed, Scott shared the water with male and female swimmers from Switzerland, Ireland, Australia, Sweden and England as well as Americans. “Each swimmer is assigned both a boat and kayaker,” said Scott. “The boat has a driver as well as an observer. One difference with this swim compared to Catalina and Tahoe was that it’s all done in daylight. “That meant I got a lot of visual looking around,” said Scott. Next summer brings a new challenge for the Menlo Park orthodontist. He’s registered to swim the English Channel.